Butterick knows how to pick a pattern for their catalog cover, don’t they? 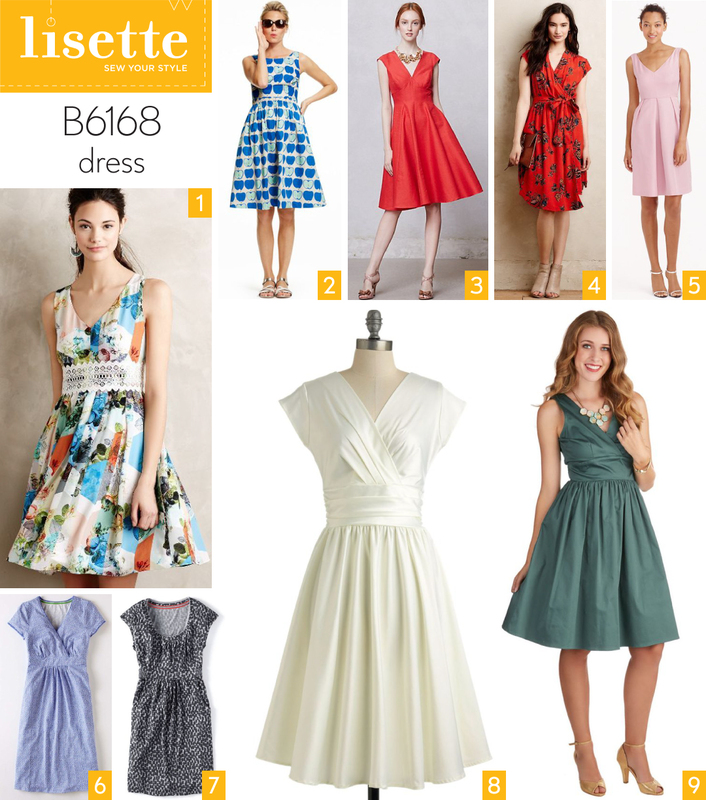 The new Lisette B6168 dress is clearly your favorite from the latest Lisette collection. And with good reason. It’s a versatile dress that can be sewn for everyday wear as well as for fancy occasions. And of course it has that figure-flattering fit-and-flare silhouette, which is always a popular choice for virtually any body shape and size. 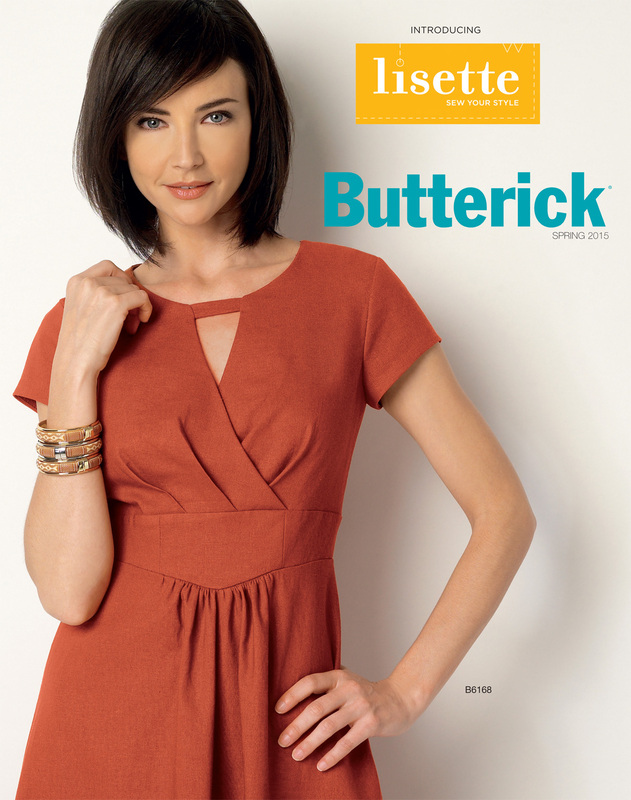 I’m excited to sew this dress, too, and I have the perfect fabric for it! Now, what fabrics and styling choices would work for this pattern? Here are a few suggestions from my Lisette Pinterest board. This print is an interesting combination of vintage and contemporary. It works well with this style, I think. And by the way, it would be easy to add fullness to this skirt if you’re so inclined. If you can’t pass up those cute printed cottons, don’t worry because they’ll work great for this style. Summer sundress, anyone? Red silk dupioni. The nubby texture keeps the dress interesting and the sheen of the silk give it a little glam sparkle for that special occasion. Ignore the messy draping on this dress. I’m loving the red print, which would work so nicely for this pattern. Pink faille. Wedding party. Or even casual bride. In the right color, this dress could easily transition to date-night dress without blinking an eye. And in black faille it could be the most elegant little black dress ever. Don’t be afraid to try this dress in printed cottons. Sateen, lightweight canvas, and even quilting cottons will work if you’re looking for an everyday dress. Throw on a cardigan or a short blazer for instant layering style. In white or creme-colored silk. Very pretty and fancy! I don’t know what happened to the fit of this dress, but if you can look past it to the color, fabric, and styling you may find some inspiration. The gold sandals are a nice touch, aren’t they? I love this shade of green, and the styling would be great for a wedding. Another dressy version, this time in a pretty yellow. Yellow is having a big fashion moment right now, have you noticed? In general I prefer to wear it as more of an accent color, but for a dressy dress, it’s really very pretty! If you find just the right special-occasion sateen floral you can sew something magical like this dress, which has a little mystery and lots of elegance. Again, wedding, date night, party dress, this dress can be worn for lots of fancy occasions. 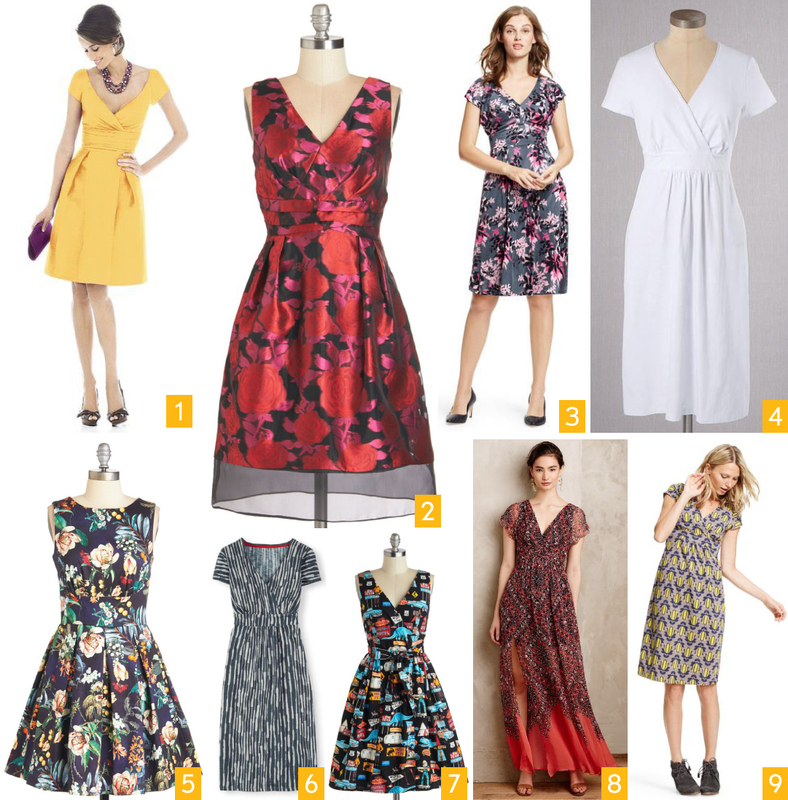 A pretty neutral-ground floral can result in a versatile dress. Wear it with bright or rich-colored solids for a variety of looks. A plum- or navy-colored velvet jacket would be an interesting texture addition to an outfit, wouldn’t it? I think it would be fun for spring. White cotton. Summer. Perfect together. This abstract indigo print could be worn all spring and summer so easily, couldn’t it? Use accessories to change up the style from day to day and it will be extremely versatile. Proof that even a crazy conversational print can work for a dress pattern like this. Be fearless, my friends! This boho-inspired dress could be inspiration for a maxi-dress version of the pattern if you’re so inclined. If you can’t pass up a fun cotton print, here’s your chance to wear it yourself! There are additional images on my Lisette board if you want even more ideas. Now, one last photo before I go. A few of you were unhappy with me last week for not showing more diverse body types in these photo mosaics, especially when I claim that these styles will work well in a variety of sizes and proportions. I promise that I do look for different images when I’m writing these posts, but I’m sure you understand that most fashion photos feature only one type of person–very slim, very young, very white models. A project I have in the works will help in this regard, so I ask for your patience. But I do like this photo, which I just came across and which shows a similar silhouette to B6168. Stay tuned for the sew-along. And in the meantime, which fabrics are you considering? I’ll show you my choice soon. I think it would be great in a drapey linen or cotton linen blend. I’d like to make it in plain navy or black using an Japanese style print fabric for the waistband (obi style). I think that would be beautiful! I hope you’ll show us when its’ done! I can attest that quilting cotton works for this dress- just finished mine! Love it! Yours is so pretty Meg! Thanks for all the tips/notes! I am contemplating a quilter’s cotton b but in hounds tooth print. Enjoy your new summer dress.